1. Baby pigs are called piglets. The name for a female adult pig is a sow and a male adult pig is called a boar. 2. Contrary to popular belief, pigs do not like to get dirty and wallow in the mud. In fact, they are cleaner than most animals. However, they do get in the mud when the weather is hot because it helps keep them cool. But they only do it out of necessity. 3. Pigs have a very keen sense of smell. They can often find things underground just by using their sense of smell. 4. It is not unusual for an adult pig to drink as much as 14 gallons of water in one day. 5. A pig’s scream can be as loud as 115 decibels. That’s louder than the noise of a jet engine taking off from a runway. 6. Pigs will go far away from their living and eating area to relieve themselves. Even baby pigs will do the same when they are only a few hours old. 7. The pig is considered to be one of the smartest animals in the world. The only animals that are considered smarter are the dolphin, chimp, and elephant. 8. There are about 1 billion pigs on the planet at any given time, making it one of the most abundant and plentiful mammals in the world. The largest population of domesticated pigs is in China. 9. In some cases, pigs have been used by police forces to sniff out drugs in much the same way that dogs are used. During war times, they have also been used on battlefields to sniff out landmines. 10. A sow can give birth to as many as 12 pigs in one litter. The average litter includes between 8 and 12 at a time. 11. The average pig will eat about 5 pounds of food every day. That comes out to about 2 tons of feed each year. 12. Hogs are simply what pigs are called when they are specifically raised for meat. There are an estimated 840 million hogs being raised on farms in the world right now. 13. 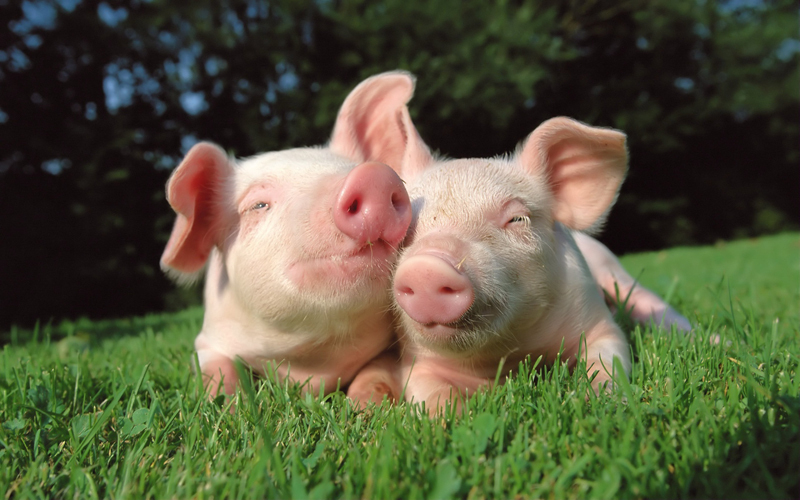 There are twice as many pigs in the country of Denmark than there are people. 14. A pig’s tongue has about 15,000 taste buds. A human only has about 9,000 taste buds on their tongue. 15. The heaviest pig on record was named Big Bill. He was discovered in 1933 and he weighed more than 2,550 pounds! 16. Pigs participate in a behavior called “rooting.” This involves them digging into new soil and unsettling it, which is helpful for plant growth. This is essential to help maintain a proper balance in our ecological system. 17. Pigs are very social animals. They enjoy spending time with each other and they rarely show any hostility towards other animals or humans. 18. Researchers have identified at least 20 sounds that pigs use for communicating with each other. 19. The largest litter that a sow ever gave birth to on record is 37 piglets. Of these, 36 were born alive and 33 of them survived. 20. The pig was first introduced to North America in 1539 by the famed Spanish explorer Hernando de Soto. 21. There are 15 known species of pig. Some of the species names include the Bearded pig, Berkshire pig, Yorkshire pig, Hampshire pig and several others. 22. Pigs have four toes on each foot. However, they only use the middle two toes when they are walking. This often makes it look like they are tiptoeing when they walk. 23. The valves from a pig heart are so similar to that of a human heart that they are often used when a person needs one or more of their heart valves replaced. 24. There are at least 40 medicines and other pharmaceutical products that use pig products in them. 25. A pig can run a mile in seven minutes.